Macedonian authorities have begun removing signs refering to the country’s main motorway as the “Alexander the Great” highway. Officials voted to rename the road the “Friendship” highway in earlier this month in a bid to calm already fraught relations with Greece. Athens has repeatedly complained about Macedonia’s claim over Alexander the Great, asserting that the historical leader as an exclusive part of Greek hertiage. A total of 19 signs will be removed from the motorway, which runs from Macedonia’s border with Serbia to the country’s boundary with Greece. The Alexander the Great Airport in Skopje will also be renamed. The move follows the decision to draw up a shortlist of statues to be purged from the streets of Skopje due to their inflammatory effect on international relations. The monuments were erected by the previous Macedonian government as part of their multi-million dollar flagship project, Skopje 2014. 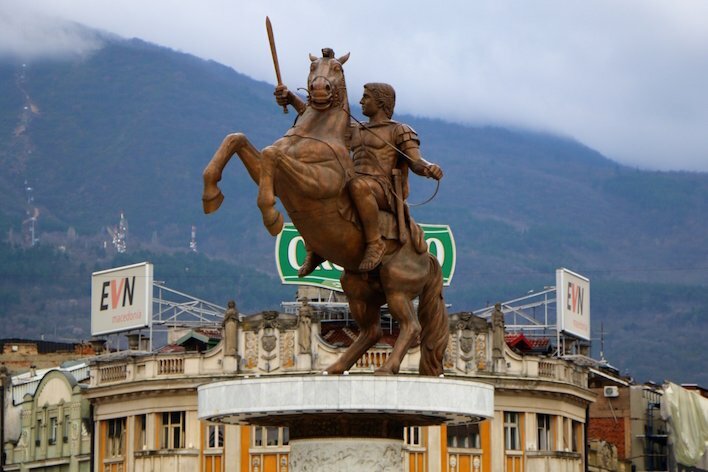 Officials working under former Prime Minister Nikola Gruevski hoped that the faux neo-classical monuments, many of which centred on Alexander the Great and his father, Phillip II, would inspire local pride, boost tourism, and build a strong Macedonian identity.